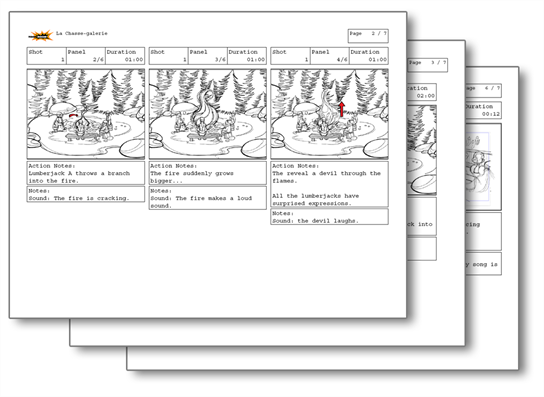 Creating models requires two main reference sources, the script and the storyboard. Once you have the script in hand, you can learn about the characters and their personalities, the props, the ambiances, and so on. This will be your main reference, so it is very important to read it carefully. The storyboard is the second reference source and it can be quite useful as well. Although it will not yet be the final version of the storyboard, it will show you what the character is doing and what props need to be designed. Once your scene is created, you can open it and set your workspace. To sketch the characters, props or locations directly in Harmony, you will mostly use the Camera or Drawing views along with the Colour, Timeline and Tool Properties views.